Monona has worked in a variety of roles within social change philanthropy over three decades. 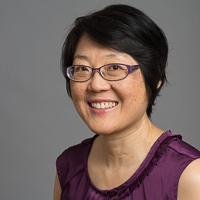 Most recently, she directed the Capacity Building Initiative of the Four Freedoms Fund, providing grants, training, shared metrics, and peer learning to strengthen the U.S. pro-immigrant field. As a member of the Four Freedoms Fund team, she helped to raise and regrant over $100 million to 200 organizations. In 2010, Monona co-created and launched the Freedom from Fear Award, a one-time national prize honoring ordinary people for extraordinary acts of courage on behalf of immigrants and refugees. Monona has worked as a consultant for the Ford Foundation, Open Society Foundations, the Carnegie Corporation of New York, and Rockefeller Philanthropy Advisors. She began working in philanthropy as Associate Director of the North Star Fund and Program Officer at the F.B. Heron Foundation. As an activist, Monona is a co-founder and former staff member of CAAAV Organizing Asian Communities. Most recently, she published her mother’s memoirs: Riding With The Wind: Three Generations of My Family in China by Fay Hoh Yin. Monona is a graduate of Yale in American Studies and lives in Brooklyn with her husband and daughter.